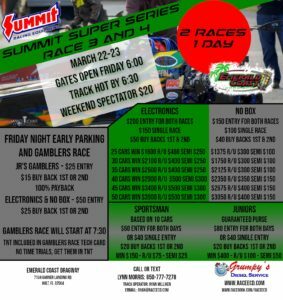 Join us for the 2019 NHRA Summit ET Series opener at Emerald Coast Dragway! February 23rd is a rainout date from our January 19 date that got rained out. Racing action on Saturday & Sunday, early parking starting 6pm Friday, gates open at 8am Saturday and time trials starting at 9am... weekend camping welcomed & encouraged, see flyer for more details!